Nic salts are well-absorbed to the bloodstream. It means that they provide vapers with strong and long-lasting nicotine effect. The trend is to provide high concentration of nicotine in nic salts e-liquids. This might be ideal for people who want to quit smoking or just switch from ordinary cigarettes. Thanks to high nicotine concentration per puff, nic salt e-liquids users can experience a nicotine effect comparable to the effect after smoking an ordinary cigarette. 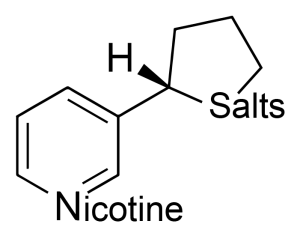 Apart from this, as nicotine salt e-liquids are more acidic (pH around 5) they are incredibly smooth. It means that one of the main sensations of vaping – the throat hit, becomes less harsh! The abovementioned factors provide more satisfactory experience for the user – you can be on a higher level of nicotine with less harsh on your throat. Thanks to its smooth taste, nic salts can be vaped with very high concentrations, (even 18mg!). Stay tuned for more info about the latest revelation in the e-liquid market.